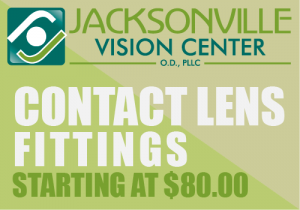 We are a trusted name in eye care located in Jacksonville, NC. Regardless of your age or physical health it is important to have regular eye exams. During your comprehensive eye exam, Dr. Taylor will evaluate your overall visual health and determine your prescription for eyeglasses or contacts as well as examine your eyes for allergies, dry eye and many other common eye issues and diseases. Regular eye exams help monitor any change in the health of your eyes. Early detection can lead to better treatment for eye disease and can help preserve your vision and eye health. Cataracts, Glaucoma, Diabetic Retinopathy, and Macular Degeneration are a few of the more common diseases Dr. Taylor will check for during your eye exam. We carry the latest styles in frames and will help you find the best fitting frames for your lifestyle. Some brands we carry are Gucci, Guess, Nine West, Kate Spade, Nike, Juicy Couture, Bebe, Cool Clip, Easy Twist, Silhouette, Ted Baker, and more! We're conveniently located off Western Blvd. in Jacksonville, NC.